After a long weekend of New York dining, I should be ready for a night at home with a full plate of lettuce. Instead I hop on the Metro to Gallery Place, where I check out The Smith with a group of girlfriends. When it comes to DC dining, if you sit on the sidelines for too long you miss out. And there’s nothing that motivates me more than the Fear Of Missing Out. The Smith, with four locations in Manhattan and now one in DC, has a philosophy that’s easy to embrace. “We love to make people happy.” A boisterous energy makes it a fun spot, if not the best place for intimate conversations. The Smith is best described as a modern American brasserie with a New York vibe. The menu includes chicken pot pie, burgers, steaks, and macaroni and cheese. It’s the dishes infused with global accents that capture my attention. Four people among our party of seven order vegetable bibimbap as a main course. 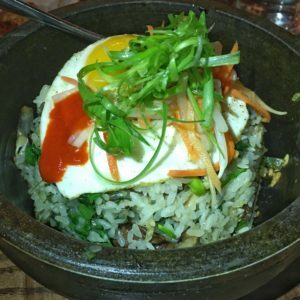 The dish is a heaping bowl of crunchy rice mixed with shitake mushrooms, spinach, edamame, house made kimchi, and topped with a sunny side up egg. I enjoy the texture of the dish, although I find the heat of the kimchi too timid. Butternut squash rings are quite pleasing, sweet and crispy, with thick harissa aioli adding some oomph. 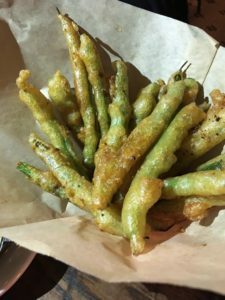 Fried beer battered string beans with ranch dressing are light and airy, a nice snack to start. 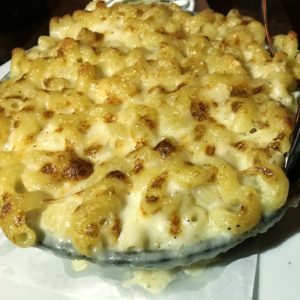 A luscious Mac and cheese served steaming in a skillet stands out, with a blended trifecta of Gruyere, Fontina, and Parmigiano Reggiano. On the lighter side, kale and quinoa salad with cranberries, ricotta salata, and toasted almonds spotlights the restaurant’s commitment to fresh, quality ingredients. The Smith has a classic meets modern vibe, with black and white ceramic floor tiles and glossy white tiled walls. (See photo gallery here.) A focal point is a back-lit wall behind the bar, packed from floor to ceiling with bottles. Enthusiastic servers enhance the experience, but they may need to shout to compete with the roar of the crowd. The Smith has only been open for a short time, but it’s already proving to be a draw. It should be a popular spot, pairing nicely with events at the nearby Verizon Center. Does The Smith succeed in its mission of making people happy? My visit to The Smith allays my FOMO, at least for the time being. This makes me happy. One of my friend has fond memories of visits to the Midtown Manhattan locations, so The Smith makes her happy. The rest of our group is happy with main courses ranging from bibimbap to “big salads.” We skip dessert, but if I was to indulge in something sweet, s’mores in a jar would bring me some joy. 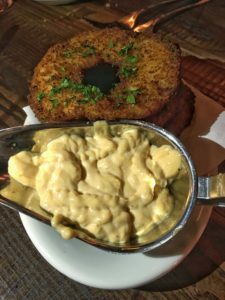 As restaurateurs continue to expand their brand into DC from New York and other cities around the country, the dining options here continue to grow. And this should make everyone happy. Nice review and it was a happy evening! I look forward to trying The Smith for brunch some time. I hear good things!